The Maine Society of the Sons of the American Revolution (MESSAR) is the state affiliate for the National Society of the Sons of the American Revolution (NSSAR). It was organized in Portland in 1891. The preliminary meeting was held February 21; a proposed Constitution and By-Laws were presented for consideration February 28, and were adopted March 14. The election of officers followed March 28. Any man shall be eligible for membership in the Maine Society Sons of the American Revolution who: Being of the age of eighteen years or over and a citizen of good repute in the community, is the lineal descendant of an ancestor who was at all times unfailing in loyalty to and rendered active service in, the cause of American independence, either as an: officer, soldier, seaman, marine, militiaman or Minuteman, in the armed forces of the Continental Congress, or of any one of the several Colonies or States; or as a Signer of the Declaration of Independence, or as a member of a Committee of Safety or Correspondence; or as a member of any Continental, Provincial, or Colonial Congress or Legislature; or as a recognized patriot who performed actual service by overt acts of resistance to the authority of Great Britain. Maine In 1776- At the time of the American Revolution, Maine, not a State until 1820, was part of Massachusetts. Because of Maine's remoteness from the authorities in Boston and the Continental Congress in Philadelphia, the inhabitants received little military support despite the proximity of the British across the border in Canada and constant pressure from the Royal Navy along the coast. Apart from Benedict Arnold's ill-fated expedition to Quebec through the wilderness of western Maine, most military action took place up and down the vulnerable coast. 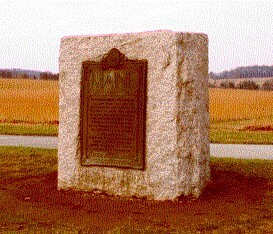 The memorial above was placed at Valley Forge by the Maine Sons of the American Revolution in the early part of the 20th century. Please look at some links regarding the Revolutionary War in Maine.